How does part orientation affect a 3D Print? PLA vs. ABS: What's the difference? Learn how castable FDM prints can be used to produce low-cost metal parts via investment casting. Castable FDM patterns, when used in conjunction with the investment casting process, can be used to produce large metal parts at very low cost, with features that would not be possible using traditional manufacturing techniques. 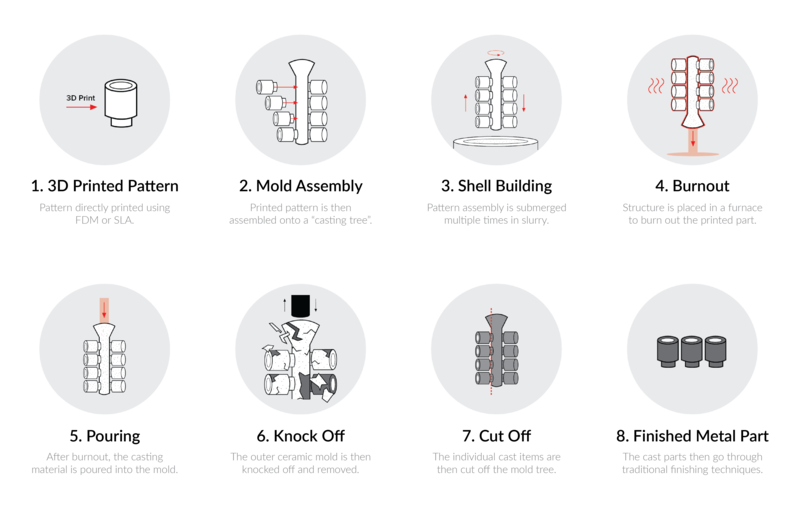 This article explains the benefits of using FDM 3D printed patterns and provides a framework for decision making on when to use this process over alternative methods, like DMLS, or CNC. For low volume production of metal parts investment casting, CNC machining and DMLS are all viable solutions. The advantages of each method of manufacturing are summarised and compared below. More details on each method can be found further down in this article. It’s important to note that everything is ultimately dependent on the geometry of the design and the table does not always apply. It’s intended as a general guideline for decision making. A cost comparison of each of the technologies shown above is illustrated in the table below. 3 different parts were compared, each with varying geometries. 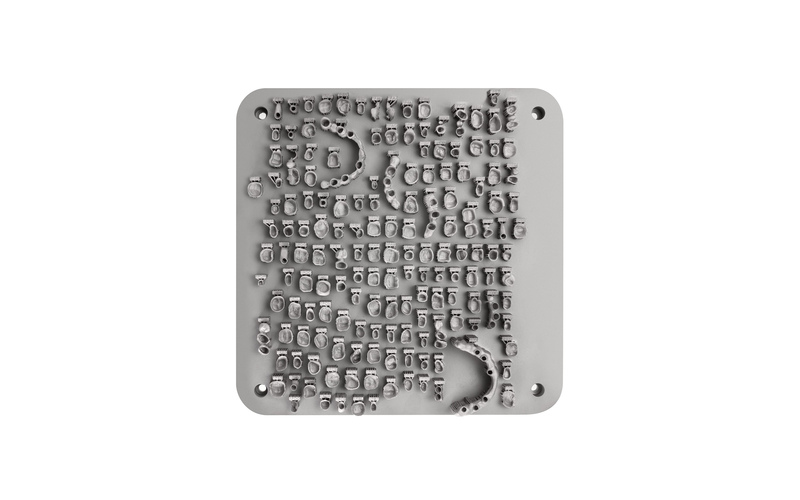 All quotes are for parts made from stainless steel. All parts are approximately 150mm x 130mm x 55mm in size. DMLS is a powder bed fusion technology that is used to produce metal parts to a high level of dimensional accuracy. The additive nature of 3D printing means that very complex designs are able to be created. The design freedom offered by DMLS has seen it adopted by many industries (automotive and aerospace) where weight optimisation and performance are critical (the cost of operating a commercial aircraft is roughly €1000/kg meaning any weight saving result in significant savings in operation costs). This has seen these industries willing to justify the high per part cost of DMLS based on the cost savings of producing complex lighter parts. DMLS can produce parts from a large range of metals including aluminium and stainless steel as well as exotic biocompatible materials used in dentistry and medical industries like titanium. The main limitations of DMLS are the high cost, small build size and long lead times compared to other 3D printing technologies. 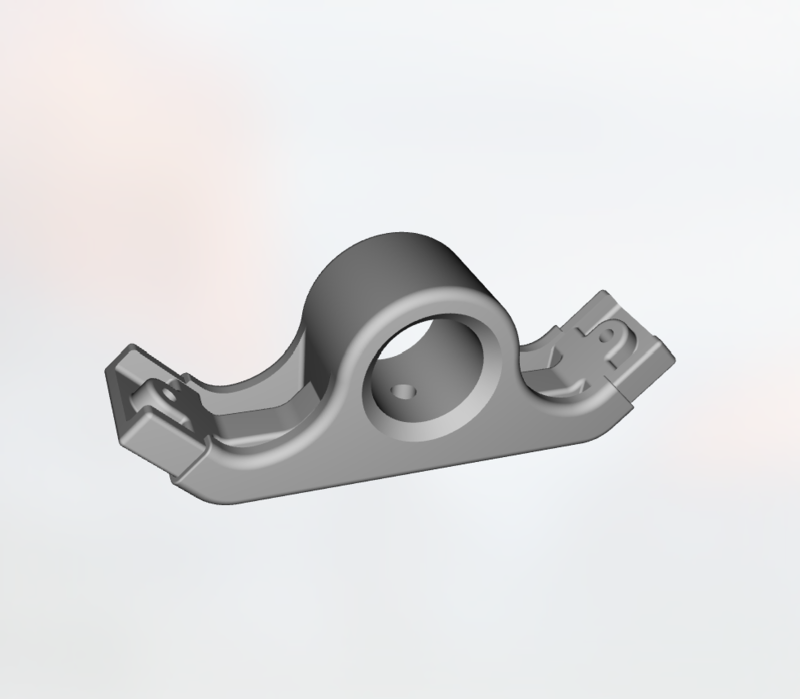 Parts also require support material to limit the likelihood of distortion and warping occurring and this must also be removed after printing further increasing lead time and cost. 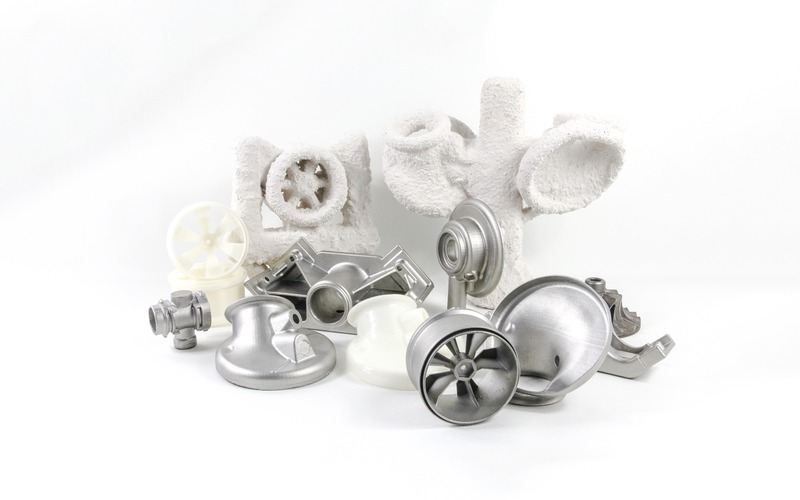 The investment casting process traditionally uses wax patterns to produce molds for casting, as it has a very clean burn-out with no residues. The image below presents the process. For low-run investment casting, patterns are traditionally machined from a wax block via CNC. Alternatively, for larger series, a die is machined and the patterns are created by casting the wax using the die. Tooling is a very expensive investment with production of the dies often taking a very long time (2 - 6 weeks). 3D printing is now regularly used in conjunction with a range of investment casting applications to produce patterns from castable materials. Castable 3D prints are commonplace in the dental and jewelry industries and are generally produced via the SLA / DLP printing process. This is a vat-photopolymerization technology that is able to produce parts with a very smooth surface and extremely fine details. The main limitation around SLA is the printer build volume size, or the high cost involved for larger patterns. For larger metal parts, castable FDM offers a cost effective, rapid solution. 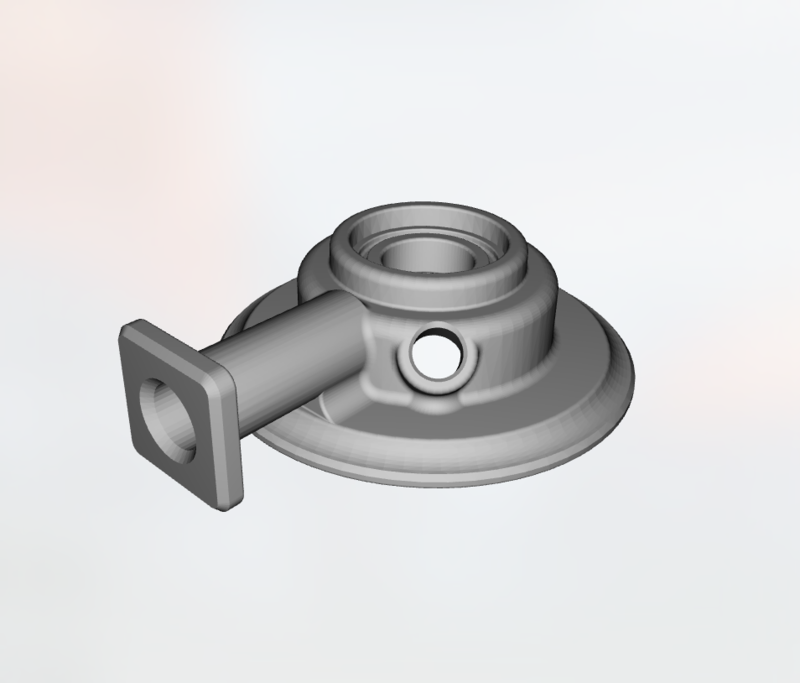 Small, intricates design are perfect for SLA investment casting. 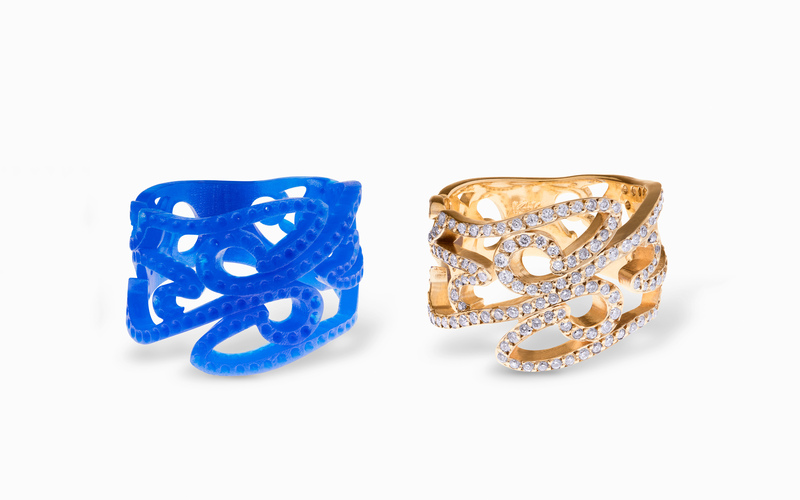 The image above shows a castable pattern (left) printed via the SLA process and the final cast ring (ring) (image courtesy of Formlabs). For larger metal parts, castable FDM offers a cost effective, rapid solution. For larger parts, creating patterns via SLA no longer becomes feasible due to the high cost of resin and the build volume of most SLA machines. Castable FDM offers a low-cost solution allowing parts to rapidly be printed. FDM is a material extrusion technology. 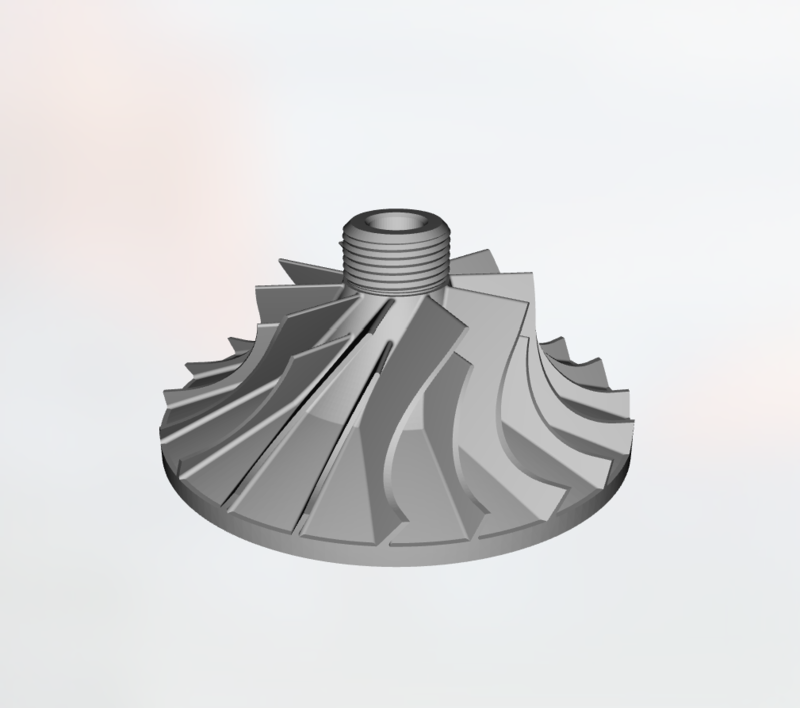 After printing, the surface of the parts are smoothed via micro-droplet polishing resulting in patterns with very smooths surfaces (a requirement for a high quality investment cast). A range of FDM printed patterns, molds and final cast parts. Low-cost: FDM is the lowest cost method of 3D printing and eliminates the need for expensive tooling. Large build size: FDM printers typically have a much larger build size (up to 450 x 450 x 650 mm) when compared to DMLS or SLA printers. As material costs are low, FDM is particularly more competitive as part sizes increase. This article will discuss the requirements within the medical industry that make AM an ideally suited technology for many applications. 3D Hubs is the world's largest network of manufacturing Hubs. With services connected in over 140 countries, we'll find the fastest and most price competitive manufacturing service near you. Unfortunately we couldn't find any result for the current search, try changing the keywords. Didn't find the article you were looking for?